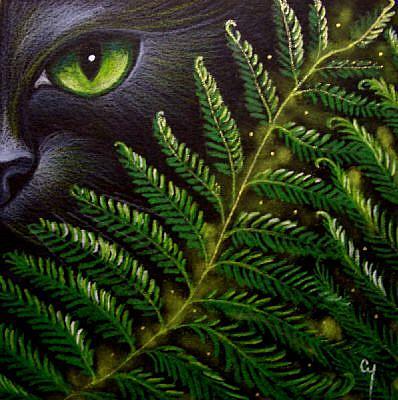 HERE AGAIN WITH MY BLACK CAT BEHIND THE FERNS. Added a delicate Gold Glitter to the Fern that you can't see in the picture. Because I like to draw my Cats with Flowers, searching for a possible Fern Flower...look the information that I found. I hope you like it too. In Slavic Mythology ( evolved over more than 3,000 years), ferns are believed to bloom once a year, during the Ivan Kupala night. Although it's exceedingly difficult to find, anyone who takes a look of a fern flower will be happy and rich for the rest of his life. According to the myth, this flower blooms for very short time on the eve of the Ivan Kupala Day. The flower would bring fortune to the person who finds it. In various versions of the tale the fern flower brings luck, wealth, or the ability to understand the animal speech. Similarly in Finland, the tradition holds that one who finds the seed of a fern in bloom on Midsummer night, will by the possession of it be able to travel under a glamour of invisibility and shall be guided to the locations where eternally blazing Will o' the wisps mark the spot of hidden treasure caches. Wow!!! Maybe, my Black Cat is looking for the Fern Flower too! ;) Used Artagain/Strathmore 60lbs. paper with Prismacolor Premier Colored Pencils/Soft Pastels/Gold Glitter.